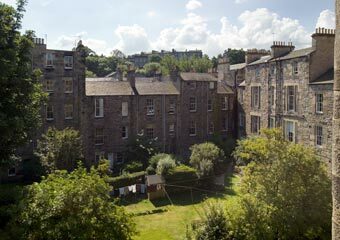 Situated in Stockbridge, a fashionable "village" in central Edinburgh (about 15 minutes walk from Princes Street - or quicker by bus), this two bedroom apartment is ideal for a couple though it also has a small single bedroom and sofa bed in the living room so could accommodate 5. Stockbridge has the best cheese shop in Edinburgh , Mellis, an organic food store, Waitrose, a delicatessen, restaurants, bars and the Royal Botanic Gardens - the best place for lunch al fresco, is just 5 minutes walk away. Guests have access to the private garden area behind the house, and there is 4 hour metered parking nearby and free parking within a 5 minute walk. The bus stop outside has regular buses to Princes St, Ocean Terminal, etc. 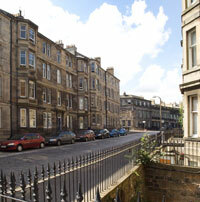 The apartment is on the 2nd (US 3rd) floor reached by a traditional Edinburgh shared stairs. 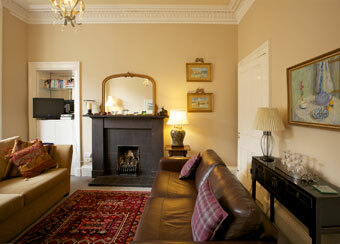 Two views of the Living Room. It has an original black slate fireplace with living flame gas fire, two sofas (can be converted into a bed), television (with Sky and Virgin), DVD and CD player. Behind the sofa, in the bow window is a dining table seating 4 to 6. 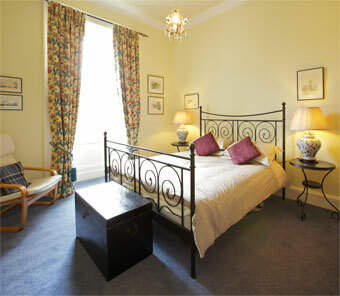 Double bedroom, with a King-size bed. 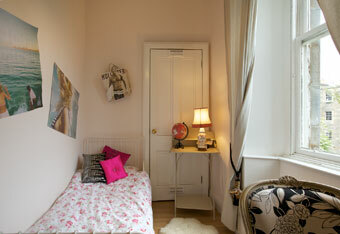 Single bedroom, with child's bed. Both bedrooms overlook private gardens at the back of the house and because of the lack of traffic noise are quiet for a good night's sleep. The apartment has free Wi-Fi broadband. 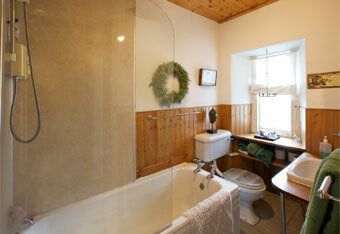 High seasons: Easter, August, Christmas and New year £100 per night for two people plus £10 per extra person. 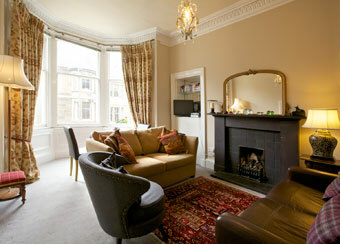 Other dates: £70 per night for two, plus £10 per extra person. Switch, Visa and Mastercard accepted. 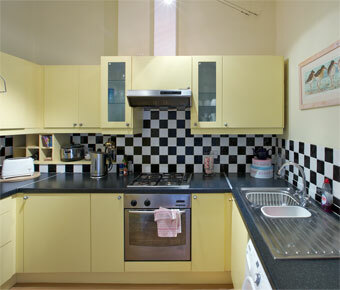 A deposit of 25% secures your booking. Entry is normally after 4pm, departure before 11.00am, but these times are negotiable. Right; View of the gardens from the bedroom windows. Please tell Raewyn you found 11 Leslie Place through About Scotland!